RENEW is saddened by the death of former Representative Steve Hilgenberger, a solid and vocal supporter of renewable energy and other causes that exemplified his care for the people of his district and the State of Wisconsin. Representative. Hilgenberger was a major and tireless supporter of the 2009 Clean Energy Jobs Act. 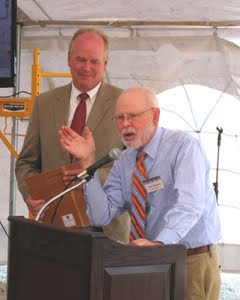 Pictured above, Rep. Steve Hilgenberger, speaking at the dedication of the Montchevre-Betin digester, October 6, 2010 in Belmont, Wisconsin. On the left is Sen. Dale Schultz. as well as gentle decency.